I never thought that I’d find myself obsessed with a series about zombies. But it’s happened – The Forest of Hands and Teeth series has really wormed its way into my heart. 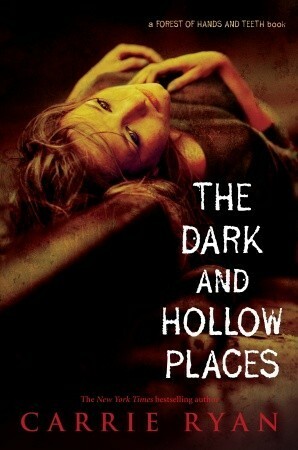 The Dark and Hollow Places is my favorite book of the trilogy, and it’s certainly a fitting conclusion. With beautiful writing and engaging characters, I just loved it. In fact, if I could, I’d probably end my review with that – I loved it, plain and simple. Annah is my favorite heroine, even though she’s “broken” (which is something she too says about herself). She’s scarred and wounded from too many things that have happened to her, both physically and emotionally. That’s certainly a good reason for her to be prickly and fearful and unwilling to let anyone close to her. But despite those things, she was strong, brave, creative and just incredibly stubborn, steadfast, loyal and true. She’s a fighter; despite many times when she thought about giving up, she never, ever did. To me, that made me see her as a beacon of hope (though she’d probably disagree with me). And then there’s Catcher. We know him from the second book, but he is incredible in this story. From the moment that he first appears, I already knew that I was going to slowly but surely fall for him even harder than I did before. He still cares deeply about Gabry, but I loved watching him open himself up and be vulnerable with Annah. He was so brave and kind and generous in this book. But what really made me fall for him was the passionate, fierce love he admits to having for Annah. I witnessed the moments that proved that myself; they were definitely breath-taking and heart-wrenching and absolutely wonderful. Ryan’s writing was evocative, and I’m not going to lie – a tear or two may have been shed while reading this book. The story she wrote was haunting and addictive, as I simply could not put the book down despite my feelings of dread or fear for the characters. It was also intelligent, as readers are given the opportunity to finally learn the total truth about the zombies and the state of the world. It’s just so good. The Forest of Hands and Teeth series completely blew me away, much to my surprise. I certainly never expected to be completely invested in it, especially with this last book. The Dark and Hollow Places felt like the right way to end the series, and the conclusion surprised me with its hint of hopefulness. If you’re looking for a zombie book with great characters, an intelligently created plot and seriously good writing, this series is that one that I’d definitely recommend. I felt the same way about this series -- never knew I could love a zombie story so much. And I loved this. Then I went on to Rot & Ruin...and I highly recommend you do that, if you haven't yet.